Among the greatest daimyo of feudal Japan, Oda Nobunaga needs little introduction. This sword commemorates his name in steel instead of words. This new katana by Paul Chen / Hanwei features a blade forged from differentially tempered 65Mn steel with an edge hardness of 60 hrc and a back of 40 Hrc. The front of the tsuba bears likeness of Nobunaga and his family mon, and the blade side depicts two of his soldiers with yari subduing an enemy. 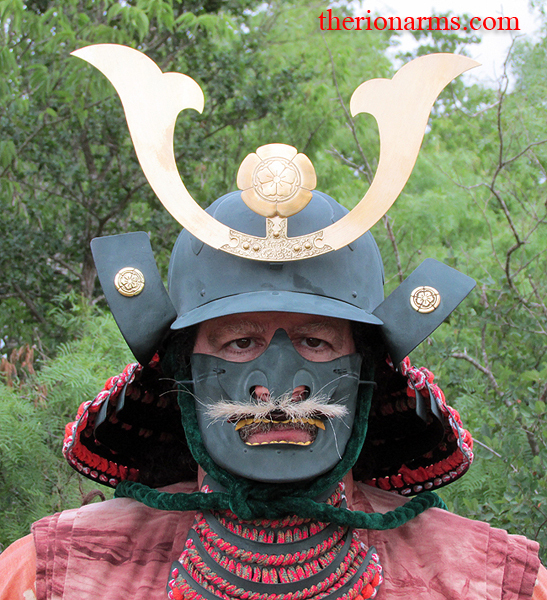 The fuchi is embossed with a gold flintlock and powder bag in homage to Nobunaga's fondness of matchlock firearms, and the koshirae shows a finely detailed rendering of Oda.s kabuto helmet embossed in silver and gold. The tsuka is wrapped in green cotton over black dyed same (ray skin), contrasted by the Nobunaga mon in silver and gold. 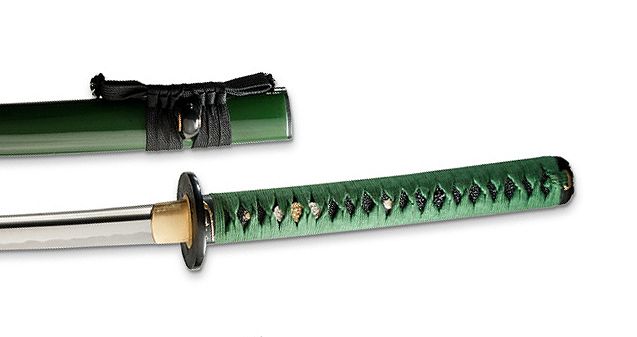 The deep green lacquered saya features black cotton sageo and buffalo horn kurikata and kojiri. This is the the crown jewel in the new General's series katana collection.